On a cloudless morning, the sun only half an hour above the horizon, a line of red and gold snaked slowly through a green rice field in Bodhgaya. 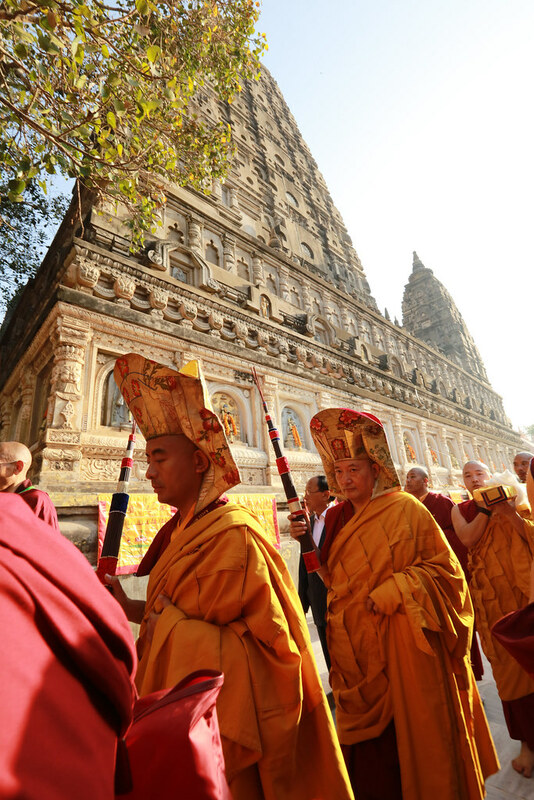 Those chosen to carry the volumes of the Kangyur, the words of the Buddha, in circumambulation around the Mahabodhi Temple were on their way from the Monlam Pavilion, their neatly folded chogus (the outer yellow robes worn for important rituals) on their shoulders. By 6:30 a.m., they had already taken sojong vows, chanted the Sanskrit prayers of refuge in the Three Jewels, and eaten a quick breakfast of butter tea and bread in the pavilion. This full moon day, Chötrül Düchen — one of the four holiest days in the Tibetan calendar — commemorates the Buddha’s first teaching to five friends in Sarnath shortly after his enlightenment. This year, it fell on the Indian festival of Holi, and the taxis and tuk-tuks were in short supply, so everyone walked. The rice fields between Tergar and the Mahabodhi temple are nearing harvest. The grains bulge in their bearded casing, not yet golden but plump and vigorous. Water still lines the paddies in the field, so the monks, nuns, and lay people had to pick their way carefully along the narrow mud walls between the paddies, roughly the width of a gymnastics balance beam but sloping and slippery. From afar, the unintended but auspicious visual effect was of a slow and dignified procession. Then the single file broadened to a wider column, snaking through a small village, before joining the main road to the temple. Efficiently and quietly, everyone progressed through security. Many bought lotus flowers and arrangements of marigolds as offerings, and everyone had a kata. Both monastic and lay devotees lined up along the upper kora route, the outer ring of the temple complex. Well ahead of the published 8:00am schedule, the Kangyur volumes emerged from the small storage temple which houses them, accompanied by gyalings and incense. His Eminence Goshir Gyaltsap Rinpoche and Kyabje Mingyur Rinpoche, in Gampopa hats, led the procession, chanting mantras and looking straight ahead in meditation. The solemn Kangyur bearers also chanted mantras, and the spectators held up their offerings and chanted the ancient Sanskrit prayer, “Namo Shakyamunaye.” As the procession passed, devotees fell in behind it, stopping respectfully to allow the monastics to go before the lay people. It was all over in twenty minutes, and the joyful participants left their katas and offerings draped over the hedges and arches of the temple entrance before returning to the pavilion. The bulk of the second morning session was devoted to the collected sangha reading through the complete Kangyur. This year, for the first time, they used the Jiang Kangyur, a version resurrected and curated by His Holiness a couple of years ago. As each monk and nun received his or her portion of the text, a low wave of sound swelled the pavilion. Lay students did their own practices, sat in meditation, or read prayers from the monlam book. Some chanted mantras and spun prayer wheels. His Holiness Karmapa had commented, in his final day of teaching Geshe Potowa’s Long Soliloquy yesterday, that we are now in the middle of the Monlam, and we should engage in “virtue in the middle,” the main practice. And it was so! When the reading finished, the assembly chanted prayers for the teachings of the Buddha to flourish in the world. May they be accomplished!